FOSAF NEWS - FOSAF’S New Membership categories - please support us! Gold Class Supporters (formerly Affiliate members) – This has been reduced to an annual subscription of R1500 in 2017. Gold Supporters will receive a framed certificate to display. They will be entitled to have an advert in the banner on our website as well as a listing on the links page. Silver Class Supporters – This will entail an annual subscription of R500 in 2017. As with the Gold Class, Silver Supporters will receive a framed certificate to display. They will be entitled to a listing on the links page on the website. Ordinary Membership – This remains unchanged and will entail an annual subscription of R290 in 2017. FOSAF provides a valuable service in protecting your flyfishing for a range of species across Southern Africa. We are working with the many clubs across the sub-continent to negotiate with Government in support of and to further your flyfishing interests. We are working with all aspects of the flyfishing sector looking at new ways to benefit flyfishers with discounts and improved fishing access. 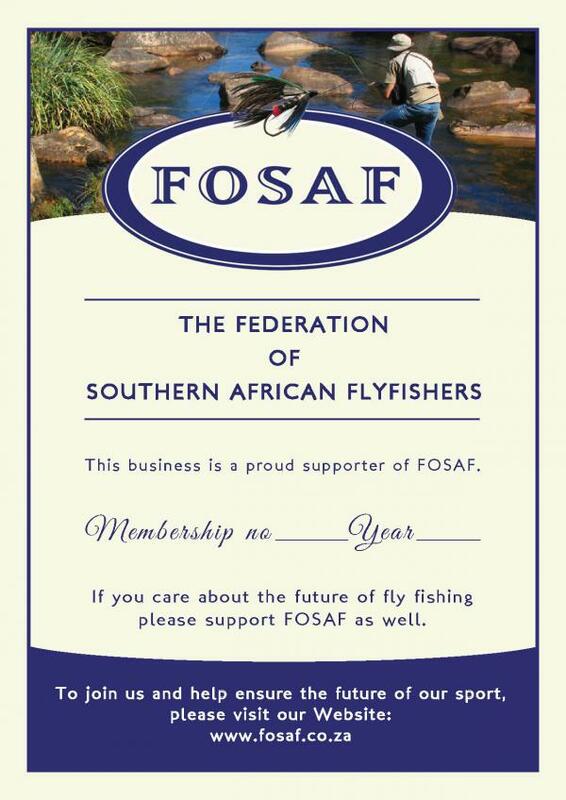 By displaying your supporter’s certificate you will demonstrate support for our efforts and help promote FOSAF and our mutual passion for our sport of flyfishing. Please go to our website at http://www.fosaf.co.za/ and use the “Join/Donate” drop down menu for an application form to be completed and submitted. Or phone Liz at the FOSAF office at 011-4675992 or email fosaf@icon.co.za to discuss your membership.